Capalino+Company client, SJM Partners has made deals recently with Marshalls, Blink Fitness, and the Fine Fare supermarket to take space in the old George Washington Bridge Bus Station in upper Manhattan. Plans to overhaul the run down facility are finally taking shape and leases are now being signed for the expanded retail space that will be available. There has been a significant increase in interest by retailers based on the overhaul plans for the complex. A $183.2 million renovation project, scheduled to start this coming winter, will quadruple the size of the retail space to about 105,000 square feet. Construction is expected to be completed in the summer of 2013. “There’s nothing like this in the area,” said Stephen McBride, SJM’s managing principal. The long-delayed plans to redevelop the aging George Washington Bridge Bus Station in Upper Manhattan are finally gaining momentum, sparking a series of new leases for its expanded retail space. Although the station has been neglected for years and the current economic climate poses a challenge to leasing the space, many think that SJM will be successful if they create the right mix of retail stores that caters to the Hispanic community that has been the core of the neighborhood for years. The 294,000-square-foot station, a transportation hub designed by the Italian architect Pier Luigi Nervi that is set against the ramps to the George Washington Bridge, hasn’t had any major renovation since it opened in 1963. The neighborhood around the station suffered from crime and high poverty in the 1980s and 1990s, and plans in 2008 to renovate the terminal were shelved by the recession. The area has been experiencing a rebirth lately with many new stores and restaurants opening causing real-estate values to climb. Retail experts believe the firm can pull it off by finding a retail mix that bridges the Hispanic community that has been there for years and neighborhoods that are beginning to see more gentrification. These include areas near Columbia University Medical Center and New York-Presbyterian Hospital and one to the north that real-estate brokers call Hudson Heights. “If they do this right, it can be a really good shopping hub, and it will bring people from the whole area,” says Faith Hope Consolo, chairman of the retail leasing and sales division of Prudential Douglas Elliman Real Estate. Planners of the bus station project say the available retail space in the area hasn’t kept up with the changing population. Some of the new space in the station will target the 12,000 commuters who pass through it daily, but much of it will be primarily focused on the local community. There was a big shift a decade ago when a lot of artists and musicians moved up here because it’s cheap as have more people who got priced out of the Upper West Side. Mr. McBride says he hopes to get rents between $60 a square feet for small, interior locations, and $175 to $200 a square foot for prime, ground-floor spaces along Broadway. These numbers are considerably higher than in the past, but still well below what space might go for at Penn Station or the Port Authority bus terminal. 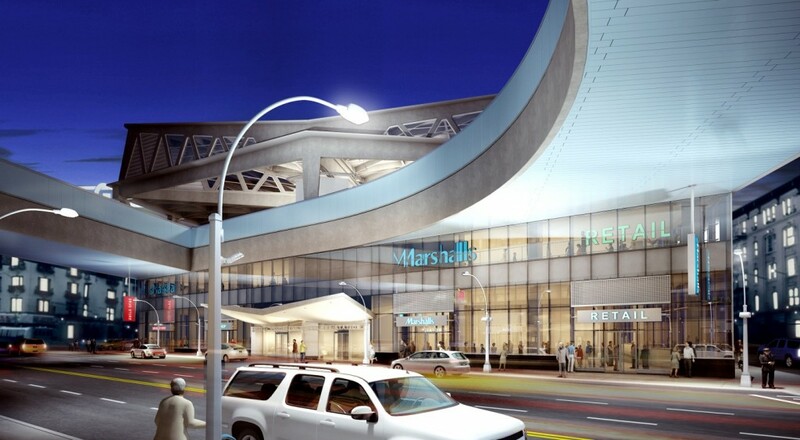 Marshalls, Blink and Fine Fare will take more than half the 105,000 square feet of retail space in the station. SJM is hoping to add a restaurant to the complex, to boost nighttime traffic, and to fill some smaller spaces with neighborhood shops. *Renderings provided by STV, an award-winning professional firm offering engineering, architectural, planning, environmental and construction management services.